Card Player’s 2014 WSOP coverage is sponsored by CarbonPoker. A total of 200 players posted the $10,000 buy-in in the 2014 World Series of Poker H.O.R.S.E. championship event, but in the end only one would walk away with the title, the bracelet and the first-place prize of $507,614. That player was Christopher Wallace from St. Paul, Minnesota. The 40-year-old poker pro known to many as “Fox” topped a stacked field of 21 players that returned for the third and final day in this event, outlasting the likes of Daniel Negreanu (18th – $18,254), Bertran ‘ElkY’ Grospellier (16th – $21,958), Justin Bonomo (15th – $21,958), Nick Schulman (14th – $26,432) and David Benyamine (11th – $32,430), all before even making the final table! 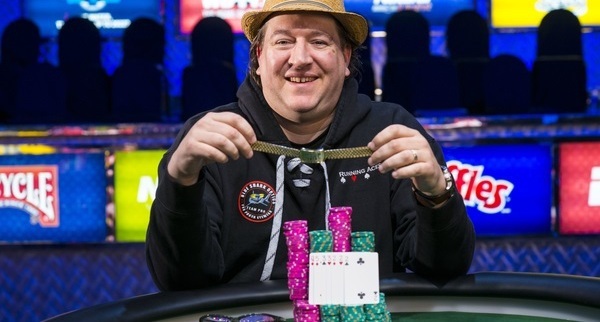 Wallace entered the final table in the middle of the pack, but was able to survive while Calvin Anderson (8th – $50,966), Bill Chen (7th – $65,273), Max Pescatori (5th – $112,066) and Richard Ashby (4th – $150,625) all hit the rail. With the elimination of Richard Sklar in third place, the final showdown was set. On seventh street Ohel check-raised Wallace, only to face a three-bet to 600,000. Ohel made the call, only to see the 10 6 6 in the hole for Wallace, giving him a full house. Ohel mucked, later saying on Twitter that he had rivered trip aces in that hand. After that hand Wallace had increased his lead to nearly 5-to-1. Shortly after it was all over, with Ohel once again making trips only to run into a full house. Ohel hit the rail as the runner-up, earning $313,715 for his second-place finish. For more coverage from the 2014 summer series, visit our WSOP landing page. If you can’t get down to the Rio, you can still compete with Carbon Poker. Click the banner below for more information. Card Player readers are eligible for an initial deposit bonus of 200 percent up to $5,000.